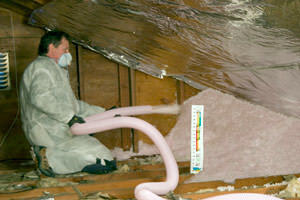 Blow-in or blown fiberglass insulation is a good choice when insulating your attic. A special machine shreds the fiberglass and then blows it through an application hose to properly cover and insulate the space. Dr. Energy Saver, A Blackdog Affiliate can provide blown cellulose, blown fiberglass, fiberglass batts or denim batts for different applications. The U.S. Department of Energy recommends between R-49 and R-60 of attic insulation in Salem, Andover, North Reading, North Andover, and other areas. That's at least a 16-in.-thick blanket of fiberglass insulation! Here we installed a SuperKneeWall by using SilveGlo EPS foam board. The Furnace and A/C units will now run more efficient due to functioning in a conditioned space. 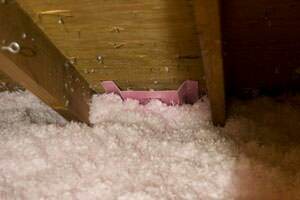 We offer Free Estimates for attic insulation in Haverhill, Methuen, Andover, Wilmington, Reading, Tewksbury, Methuen, Wakefield, Dracut, Chelmsford, and the neighboring locations. We also offer a unique system called the SuperAttic™ System, which adds a continuous & airtight layer of foam insulation beneath the attic rafters and inside the attic's gable walls. "Prompt response to inquiry. Jim really looked under the..."
Call 1-888-914-4171 or contact us online to schedule a home energy audit or a Free Estimate for home insulation in Methuen, Andover, Haverhill, and in and around Methuen, Wilmington, Reading, Chelmsford, Wakefield, Dracut, Tewksbury, and Burlington.